The Playful Thinking series from MIT Press publishes engaging and visually compelling volumes on game-related topics, authored by both scholars and industry luminaries, that are easily accessible to academics, professionals, and laymen from a broad range of backgrounds and levels of experience. Each volume ranges between 25,000-30,000 words (approximately 100 pages) in length, is small enough to be easily thrown in a backpack or a coat pocket, and is written in a way that is accessible and compelling to academics, professionals, and educated readers in general. Each volume focuses on an innovative and clearly demarcated issue concerning video games. Each volume has a hook and theme that is relevant to readers outside video game studies. The prototypical volume discusses video games and x, applying insights from other fields to video games, and reflecting upon what this combination yields in terms of more general insights. Short form, roughly 25,000-30,000 words. Sample topics may include video games and art, video games and architecture, video games and music, the history of video games, video games and fairy tales, etc. The Playful Thinking Series was sparked by discussions and research being conducted at the MIT Game Lab (then the Singapore-MIT GAMBIT Game Lab), a research group at the MIT Comparative Media Studies program. This is a renaissance moment for video games  in the variety of genres they represent, and the range of emotional territory they cover. But how do games create emotion? 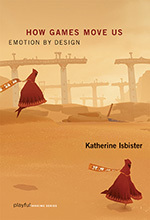 In How Games Move Us, Katherine Isbister takes the reader on a timely and novel exploration of the design techniques that evoke strong emotions for players. She counters arguments that games are creating a generation of isolated, emotionally numb, antisocial loners. Games, Isbister shows us, can actually play a powerful role in creating empathy and other strong, positive emotional experiences; they reveal these qualities over time, through the act of playing. She offers a nuanced, systematic examination of exactly how games can influence emotion and social connection, with examples  drawn from popular, indie, and art games  that unpack the gamer's experience. Isbister describes choice and flow, two qualities that distinguish games from other media, and explains how game developers build upon these qualities using avatars, non-player characters, and character customization, in both solo and social play. She shows how designers use physical movement to enhance players' emotional experience, and examines long-distance networked play. She illustrates the use of these design methods with examples that range from Sony's Little Big Planet to the much-praised indie game Journey to art games like Brenda Romero's Train. Isbister's analysis shows us a new way to think about games, helping us appreciate them as an innovative and powerful medium for doing what film, literature, and other creative media do: helping us to understand ourselves and what it means to be human. Katherine Isbister is Professor of Computational Media at the University of California, Santa Cruz, and is the author of Better Game Characters by Design. She was the founding Director of the Game Innovation Lab at New York University. Games and art have intersected at least since the early twentieth century, as can be seen in the Surrealists' use of Exquisite Corpse and other games, Duchamp's obsession with Chess, and Fluxus event scores and boxesto name just a few examples. Over the past fifteen years, the synthesis of art and games has clouded for both artists and gamemakers. Contemporary art has drawn on the tool set of videogames, but has not considered them a cultural form with its own conceptual, formal, and experiential affordances. For their part, game developers and players focus on the innate properties of games and the experiences they provide, giving little attention to what it means to create and evaluate fine art. In Works of Game, John Sharp bridges this gap, offering a formal aesthetics of games that encompasses the commonalities and the differences between games and art. Sharp describes three communities of practice and offers case studies for each. "Game Art," which includes such artists as Julian Oliver, Cory Arcangel, and JODI (Joan Heemskerk and Dirk Paesmans) treats videogames as a form of popular culture from which can be borrowed subject matter, tools, and processes. "Artgames," created by gamemakers including Jason Rohrer, Brenda Romero, and Jonathan Blow, explore territory usually occupied by poetry, painting, literature, or film. 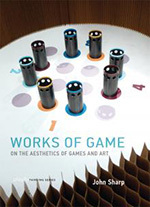 Finally, "Artists' Games"with artists including Blast Theory, Mary Flanagan, and the collaboration of Nathalie Pozzi and Eric Zimmermanrepresents a more synthetic conception of games as an artistic medium. The work of these gamemakers, Sharp suggests, shows that it is possible to create game-based artworks that satisfy the aesthetic and critical values of both the contemporary art and game communities. What do we think about when we think about play? A pastime? Games? Childish activities? The opposite of work? Think again: If we are happy and well rested, we may approach even our daily tasks in a playful way, taking the attitude of play without the activity of play. So what, then, is play? 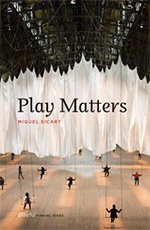 In Play Matters, Miguel Sicart argues that to play is to be in the world; playing is a form of understanding what surrounds us and a way of engaging with others. Play goes beyond games; it is a mode of being human. We play games, but we also play with toys, on playgrounds, with technologies and design. Sicart proposes a theory of play that doesn't derive from a particular object or activity but is a portable tool for being--not tied to objects but brought by people to the complex interactions that form their daily lives. It is not separated from reality; it is part of it. It is pleasurable, but not necessarily fun. Play can be dangerous, addictive, and destructive. Along the way, Sicart considers playfulness, the capacity to use play outside the context of play; toys, the materialization of play  instruments but also play pals; playgrounds, play spaces that enable all kinds of play; beauty, the aesthetics of play through action; political play  from Maradona's goal against England in the 1986 World Cup to the hactivist activities of Anonymous; the political, aesthetic, and moral activity of game design; and why play and computers get along so well. In life, uncertainty surrounds us. Things that we thought were good for us turn out to be bad for us (and vice versa); people we thought we knew well behave in mysterious ways; the stock market takes a nosedive. Thanks to an inexplicable optimism, most of the time we are fairly cheerful about it all. But we do devote much effort to managing and ameliorating uncertainty. Is it any wonder, then, asks Greg Costikyan, that we have taken this aspect of our lives and transformed it culturally, making a series of elaborate constructs that subject us to uncertainty but in a fictive and nonthreatening way? That is: we create games. Costikyan explores the many sources of uncertainty in many sorts of games  from Super Mario Bros. to Rock/Paper/Scissors, from Monopoly to CityVille, from FPS Deathmatch play to Chess. He describes types of uncertainty, including performative uncertainty, analytic complexity, and narrative anticipation. 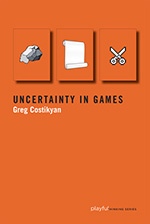 And he suggests ways that game designers who want to craft novel game experiences can use an understanding of game uncertainty in its many forms to improve their designs. Greg Costikyan, an award-winning designer of board, tabletop, roleplaying, computer, online, mobile, and social games, is Senior Designer at Disney Playdom's Dream Castle Studio. He is the author of four science fiction/fantasy novels. In video games, as in tragic works of art, literature, theater, and cinema, it seems that we want to experience unpleasantness even if we also dislike it. Reader or audience reaction to tragedy is often explained as catharsis, as a purging of negative emotions. But, Juul points out, this doesn't seem to be the case for video game players. Games do not purge us of unpleasant emotions; they produce them in the first place. What, then, does failure in video game playing do? Juul argues that failure in a game is unique in that when you fail in a game, you (not a character) are in some way inadequate. Yet games also motivate us to play more, in order to escape that inadequacy, and the feeling of escaping failure (often by improving skills) is a central enjoyment of games. Games, writes Juul, are the art of failure: the singular art form that sets us up for failure and allows us to experience it and experiment with it. 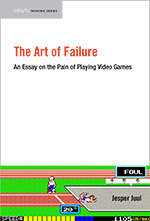 The Art of Failure is essential reading for anyone interested in video games, whether as entertainment, art, or education. Jesper Juul is Assistant Professor at the New York University Game Center. He is the author of Half-Real: Video Games between Real Rules and Fictional Worlds and A Casual Revolution: Reinventing Video Games and Their Players, both published by the MIT Press. Author discusses idea with editors. Author prepares book proposal including sample chapters. Book proposal is submitted to the editors and passed on to anonymous peer review. To begin the proposal process, please contact the editors at proposals AT playfulthinking DOT net. Mia Consalvo is Professor and Canada Research Chair in Game Studies and Design at Concordia University in Montreal. She is the co-author of Players and their Pets, co-editor of Sports Videogames and author of Cheating: Gaining Advantage in Videogames. She has most recently published the book Atari to Zelda: Japan's Videogames in Global Context, about Japan's influence on the videogame industry and game culture. Jesper Juul is Associate Professor at the Royal Danish Academy of Fine Arts, School of Design and a Visiting Associate Professor at Comparative Media Studies/Writing at MIT. He is the author of Half-Real: Video Games between Real Rules and Fictional Worlds, A Casual Revolution: Reinventing Video Games and Their Players, and The Art of Failure: An Essay on the Pain of Playing Video Games, all published by the MIT Press. Geoffrey Long is a media analyst, scholar, and storyteller exploring transmedia experiences, emerging entertainment platforms and the future of entertainment. He is currently completing his PhD in the Media Arts and Practices program at USC's School of Cinematic Arts. In previous lives, he served as the Creative Director of USC's World Building Media Lab and World Building Institute, the Creative Director and a Research Fellow at USC's Annenberg Innovation Lab, a cofounder of the Narrative Design Team at Microsoft Studios (where he worked on such projects as Quantum Break, Ryse: Fall of Rome, Adera and HoloLens), and a member of the "future of media and entertainment" think tank under Microsoft's then-CTO/CXO J Allard (where he advised the development of the Xbox One, SmartGlass. and the transmedia franchise development for Halo). He is an alum of the MIT Comparative Media Studies program and a FoE Fellow with the Futures of Entertainment community. William Uricchio is Professor and Director of the MIT Comparative Media Studies Program and Professor of Comparative Media History at Utrecht University in the Netherlands, where he considers the interplay of media technologies and cultural practices, and their role in (re-) constructing representation, knowledge and publics. He is Principal Investigator of the MIT Game Lab and of the MIT Open Documentary Lab.